The Royal Victoria Hospital, an iconic Montreal site, now stands empty. Located between McGill’s downtown campus and Mount Royal, the RVH site provides an opportunity for the University to address its pressing space deficit. In the near future, the University will undertake a feasibility study in partnership with the Quebec government to determine the potential for McGill to make use of the RVH site in partnership with the Quebec government. This study will be one of several studies and assessments that are being initiated at McGill to decide whether or not to acquire the RVH site. What type of space will be needed to foster, well into the 21st century, teaching, learning, research and community outreach at McGill? How can the site be used to increase synergies among academic disciplines? Who would be the best internal and external partners to attract to the site? How could the RVH site be used to deepen McGill’s connections with other communities (e.g. industry, NGOs, social organizations)? What is our responsibility to steward heritage buildings, green space and access to Mount Royal? The Task Force invites members of the McGill community to submit their ideas regarding a vision for the RVH. 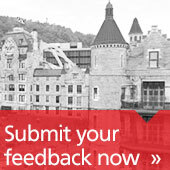 Forward your comments to rvh_vision [at] mcgill.ca. Submit your ideas regarding the academic vision for the RVH site.